Warning: This review contains spoilers for "Pacific Rim Uprising." "Pacific Rim Uprising," which opens in U.S. theaters today (March 23), is a sequel that had many tools for succeeding. Unfortunately, scriptwriters let weak action sequences and an uneven plot define the first half, which will frustrate many viewers before the good stuff finally happens. While searching for a power core, Pentecost runs into a few interesting characters. Look for a cameo from a "Spartacus" actor, as well as the fun reveal of his co-star Amara Namani (19-year-old Cailee Spaeny, in her first major role). Namani's hobby is constructing Jaegers, an illegal activity that still looks like a lot of fun. Unfortunately, they are quickly discovered and their stolen Jaeger is disabled. Faced with a choice between jail time and helping the authorities, the duo choose to join a group of Jaeger pilots getting ready to defend Earth in case the destructive Kaiju return. Here's where our space connection comes in. The Kaiju are genetically engineered creatures made by the Precursors, an alien race. The Precursors opened a portal between their dimension and our dimension at the bottom of the Pacific Ocean during the last "Pacific Rim." Thankfully, Jaegers sealed the breach in the last film. The seal still holds, but who knows how long it will last? A quick scan of "Pacific Rim Uprising" reviews shows a lot of unhappiness and, in some cases, disgust. I think a lot of this stems from frustration. "Pacific Rim" was a decent action film featuring cool amphibious warfare; behind the action was a story of loss and redemption. Both of these elements are weak in the sequel. The first decent action sequences don't really take place until the halfway point of the movie. Viewers need to sit through training sequences with a new squad of Jaeger pilots, and hear the same tired old trope of needing to face your past to do well in your future. There's also a boring rivalry between Pentecost and Nate Lambert (Scott Eastwood, "Suicide Squad" and "The Fate of The Furious.") We finally see things pick up when the Shao Corp. proudly tests a new line of remote-control Jaegers. Unfortunately, a rogue Jaeger shows up to ruin the party. Where did it come from? With a weak mystery added to an already slow plot, by now, many viewers will be restless in their seats. Thankfully, after the halfway point, a cast of secondary characters rescues the film from sinking into oblivion. "Pacific Rim" viewers will recognize reappearances from Hermann Gottlieb (Burn Borman) and Newton Geiszler (Charlie Day). Also playing a prominent role is the Shao Corp.'s Liwen Shao (Tian Jing, "Kong: Skull Island"), who is hilariously impatient with her employees' progress on getting the Jaegers ready. Many other performances in the film are lacking, but these three are a joy to watch. As they interact, we learn the source of the rogue Jaeger and how, if at all, the Kaiju are involved. The film's action sequences, unfortunately, never come close to the unique look of "Pacific Rim." One problem, already observed by other critics, is the battle sequences mostly happen in daylight, which removes a lot of the mystique and mystery as machines do epic battle. 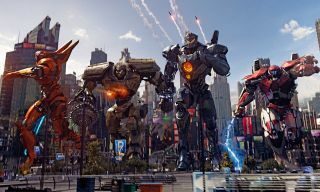 "Pacific Rim: Uprising" joined a franchise that was ripe for a sequel, but unfortunately the film doesn't carry the momentum forward. Viewers who make it to the end will see a somewhat satisfying conclusion, but it leaves me wondering — is there room for a third "Pacific Rim"? With only a part of the first film's cast still around, the franchise will need to find a way to keep loyal viewers. I suggest a future film — if it happens — should focus more on the Precursors rather than portraying them and the Kaiju as nearly mindless monsters. It worked for "Jurassic Park" sequels, so why not here?